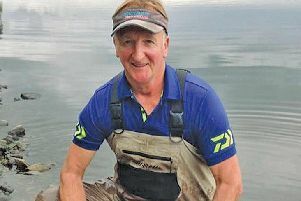 On the fishing front Ray and Bill Preedy stormed it netting 35 fish (averaging 10 to 15lb) for an estimated 400lb+ but because carp caught behind the island only counted as 5lb maximum – to give everyone else a chance – their official tally was 175lb. A long way back Jay Spittle and Dave Brigden had a 'genuine' 91lb ahead of Frank Norford and Jasper on 71lb. The sold-out raffle raised £500...and EVERY single prize was put back in the pot! With the input from the carp match, the overall total raised in this year's festival and due to handed over to Willen is close to £3,000. Thanks has to go to everyone who took part, the Parks Trust for allowing use of the out-of-bounds bank, and the people at GoneFishin who are the mainstay behind so much of the festival. A CLUE to Furzton's likely festival form came from Dale Abbott during the run-up. Moving into a matchman's swim while the guy was packing up he cast out and, within just four minutes, had hooked the 15-pounder pictured by Tackle Hub's Neil Richardson. MKAA has finished a much-needed near £10,000 refurbishment of Bradwell Lakes' concrete pegs. Some £5,000 was paid for with an Environment Agency grant, bringing the association's recent-years total of EA grants to some £15,000 – rod licence money coming back into grassroots angling. 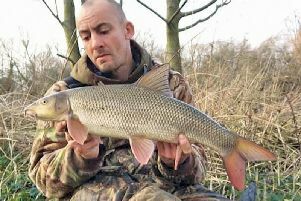 PAUL Andrews had a Lodge 22 while James Scobie and Ade Watson both had big doubles from the Big Pit. SUNDAY's Angling Trust Eastern Region Shield – Ouse from College Farm to Willington – attracted 12 teams-of-six and produced some good silverfish weights. Vauxhall's Alex Graham won with 11.200 kilo followed by Black Horse's Alan Donnelley on 10.050, Colemans' Mick Burrell 6.800, and Newport's Paul Abbott 6.180. Top teams: Image 57 points, Newport 54, Vauxhall 52, Colemans 48. MKAA were 7th, 34. TOWCESTER Vets, Barby Banks: John Broughton 56lb, John Balhatchett 34-4, Graham Martin 30-4. MK Vets, Stockton: John Robinson (four carp) 47-5, Bob Gale 42lb, Paul Barnes 38-7. NENE/Towcester; Rysons: John Broughton (22 bream to 5lb) 22-6, Les Ramsden 21-4, Mick Goodridge 14-12. CALVERT, Itters Pit: Andy Franklin 10-4, Austin Maddock 8-1, Tony Richardson 6-10. FIXTURES: Oct 16, Olney Ouse open 01234 240061.